Our commitment to supplying the absolute highest performing products on the market are achieved through our dedication to utilizing only the finest-quality raw materials and technologies. This commitment to high performance, coupled with our industry leading manufacturing and engineering excellence, offers you the lowest cost per processed ton products available anywhere in the world. Corrosion Engineering is a trusted material science expert with decades of experience designing and applying wear-resistant products to a variety of Mining and Minerals Processing applications. The phenomenal results we can achieve for our customers is rooted from our development of cutting-edge proprietary formulas of engineered rubber and technical ceramics. The premium-grade rubber compounds from which Corrosion Engineering lining systems are manufactured are high tensile, high elongation rubber compounds unique to Corrosion Engineering that are compounded for their superior resistance to impact, cutting, tearing and abrasive wear. Every batch is quality tested and formulated to ensure the highest tensile strength, outstanding chunking resistance and superior bonding to steel. Not all rubber compounds are the same! Where others utilize only one compound for every application, Corrosion Engineering has over 300 proprietary compounds utilized for specific applications. This allows us to truly custom engineer the product, and ensure each solution performs optimally in combating the specific issues of the application. The vulcanization process of rubber plays an exceptionally important role on the wear-resistant and physical properties of rubber, and is an essential factor for obtaining the best operational performance. Our steam curing vulcanization process provides superior physical characteristics of the rubber and the bond strength as compared to cold vulcanization and injection molding, ensuring your product outperforms any alternative in the same application. Corrosion Engineering is the pioneer of the ceramic composite lining system. Our technical ceramics have consistently outperformed most of the commonly used wear-resistant materials employed in material handling systems for dry substances, slurries, and dust laden gases. Our high performance ceramics will outlast materials such as carbon steel, Ni-Hard, stainless steel, abrasion-resistant (AR) steel, rubber, and other ceramics by a factor of 10 to 50 times. This translates into longer equipment life, lower maintenance costs, and reduced process downtime resulting in higher productivity. 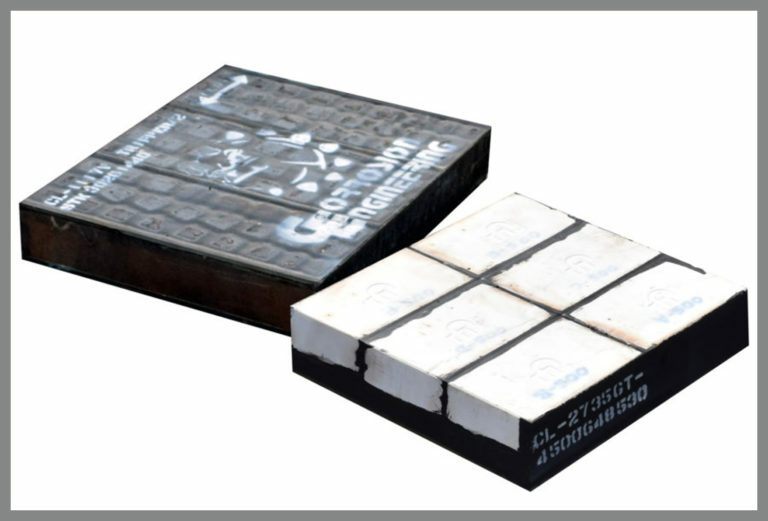 Over our decades of applying our rubber ceramic composite lining systems in a variety of mining and mineral processing applications, we have developed a variety of proprietary chemistries and geometries which are specially engineered for specific applications. For more information regarding our ceramics and how our ceramic lining systems might be ideal for your application, please contact a Corrosion Engineering Representative. Every product has exceptional bond strength between all components for ultimate reliability. Corrosion Engineering’s proprietary manufacturing process ensures a bond-strength between all product components that exceeds the tensile strength of the rubber. This results in a wear product with superior wear resistance providing reliable and predictable wear through the full thickness of the wear material. Learn about the various product lines that we offer to the Mining and Mineral Processing Industries. Learn about how our custom-designed solutions can solve the most challenging problems in the Industry.